The Spurs can advance to the WC Semifinals tonight, but it’ll take them doing what they’ve failed to do all season: win in Memphis. From a macro point of view, this series has been very much what we expected of two teams that split their regular-season meetings and have history facing off in the playoffs. Games have been physical; the pace has been glacial, and the series’ three best players have all had big moments. The deeper details — especially game to game — have been harder to foresee, and speak to the fun coaching battle we’re getting between Pop and David Fizdale. Rotations have been fluid, and there’s no telling whether unfruitful tweaks will be scrapped or not heading into the next contest. Take the Spurs’ win on Tuesday night, in which Pop doubled down on strategies that seemed costly in Memphis (namely, leaving his point guards to try and stop Mike Conley, and starting David Lee once again) and found sweet success. One absolute that may (note: or may not) carry over from that game: balance is good. The Spurs did well in surrounding Kawhi Leonard with secondary playmakers who could take advantage of the extra defensive attention he received and make things happen. Not only did we see Mills and Parker share the floor, but Pop’s faith in guys like Lee (who started over a healthy Dewayne Dedmon) and Davis Bertans (14 minutes) showed the premium he placed on ball movement and being able to attack close-outs. The Spurs didn’t require the type of herculean performance they got out of Leonard in Game 4; collectively, they put up their highest assist rate of the playoffs, turned the ball over just seven times and feasted on open looks from deep. Meanwhile, Leonard was fantastic at dealing with the Grizzlies’ traps and little body checks he’s been getting coming off screens, either quickly creating for himself or swinging the ball around to the open shooter. He continues to get sharper as the tip of the Spurs’ spear, finding new ways to exploit defenses and make his teammates better. The hope now is that the same execution and focus will travel. Teams have not fared well on the road in this series, and the FedEx Forum will provide a raucous environment for the Grizzlies to feed off of with their backs to the wall. The adage about role players struggling on the road has been largely true in this series, as Danny Green (27.8% FG), Patty Mills (40%), and Manu Ginobili (0.000%) were sub-par in their two games in Memphis. The one constant throughout this series? Leonard, who currently owns the second-highest PER in playoff history (S/O to Basketball Reference). Anything can happen tonight, but I’ll take my chances with the team he plays for. Shoutout to Coach H for pointing this out yesterday, but it bears repeating here as we get ready for tonight. The Spurs have rolled with a backcourt of Parker and Mills to go along with Leonard, Aldridge and Lee and the results, thus far, have been explosive, with a 177.2 offensive rating in 12 minutes together. Will we see more Kawhi on Conley tonight? 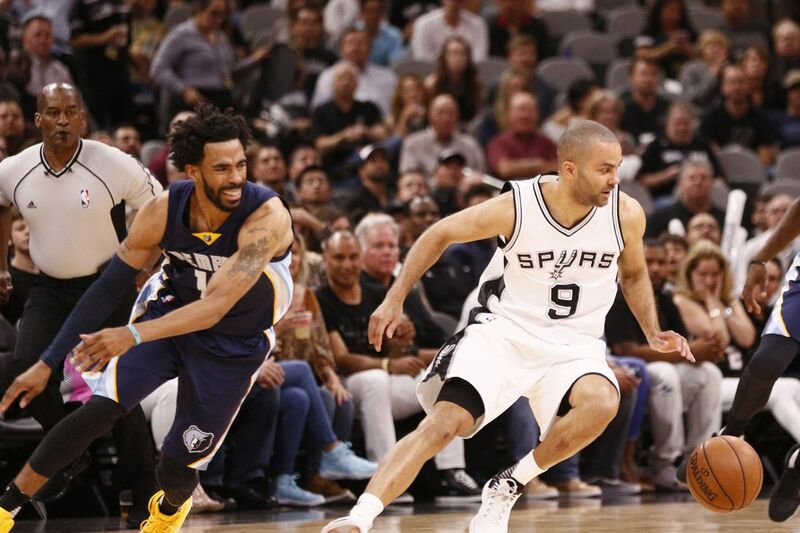 We’ve seen Pop deploy a combination of Leonard, Green, Parker and Mills on the Grizzlies’ wily point guard. I don’t have the numbers to back it up, but Leonard has appeared to be the most disruptive option by a wide margin. The Spurs don’t want to tire their best offensive player out too much, but cutting off the Grizzlies’ best option has its own merits, too. We haven’t yet seen a banner game from LA, but the work he’s done battling Memphis’ bigs deserves appreciation. He’s by far the Spurs’ most reliable defensive big in this matchup, especially given the short leash Pop has had with Dedmon. Game prediction: Spurs by 10.